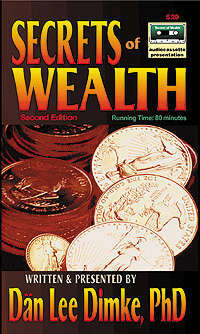 Sortlifeout.co.uk/home - Secrets of Wealth - Buy Now! "If everyone would just listen to this cassette and apply the concepts it contains, I believe everyone could solve their financial worries forever." You don't have to win the lottery or inherit a fortune from a distant relative to become wealthy. The latest scientific evidence suggests that you can do it all by yourself, without inside connections, vast business experience, or even luck! In this extended-play audiocassette presentation, Dr. Dän Lee Dimke (who grew up in the family of a self-made millionaire himself) brings a unique, inside perspective to the discussion of the Secrets of Wealth and how to master them. You'll discover how making subtle changes in the way that you think, and plan, and act, privately as well as in social settings, can dramatically transform your income, your personal power, and your long-term prosperity. "I am very pleased with my Secrets of Wealth cassette. I would like to congratulate Dr. Dimke and Future World for the excellent presentation quality and inspirational content." Total Running Time: 80 minutes.